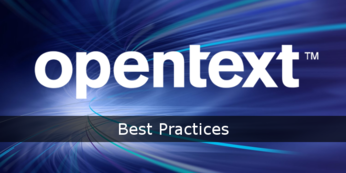 OpenText™ | My Support - Open Text Web Solutions Usergroup e.V. 07.12.2017 Hier nun die aktuelle Übersicht der verfügbaren Xample & RWD Startet Demo-Projekte für Web Site Management Server und Delivery Server bis Release 16.0 Service Pack 2. 16.12.2016 A little more detail of technical implementation of the new Asset Folder and new Asset Manager HTML5 UI. 26.08.2016 OpenText™ Web Site Management supports two main techniques of securing MS SQL Server databases: Encrypted Connections and Transparent Data Encryption (TDE). With encrypted connections to the Database Engine, the communication between Web Site Management..
18.01.2012 Many customers would like to run the Management Server application without permanently using a local administrator account on the installation server, for internal security purposes or otherwise. 05.01.2012 This document discusses Best Practices in the following Management Server topics: Definition of Terms, Organization, Structure and Navigation, Publication, SmartEdit Usabilit, Best Practice Project. 24.10.2011 The purpose of a user export in XML format is to create a backup of the LiveServer user base, which can be restored at a later time. This Application Note describes how to create and configure the LiveServer XML user export. 15.04.2011 Application monitoring is a common system requirement to detect and respond to problems before an end user is even aware that a problem exists. This Application Note describes how monitoring can be used to observe information about Delivery Server run. 17.11.2010 The Remote Lock Server module is a smaller version of Delivery Server that starts only the required modules for the central server role; for example: for building a cluster, communication notifications, and handling locks. 15.04.2010 This document provides a concise overview on how to install the Client Component features for Microsoft SQL Server 2005 on a RedDot Content server. The following installation instructions apply to Microsoft SQL Server 2005 Enterprise and Express versions. 14.08.2009 This Application Note provides steps to create a Test Project and content constraints for BLOB content types using the REF variant. The Test Project example assumes the following scenario. 09.08.2009 This document outlines various ways to simplify the URLs to Web Solutions Delivery Server (LiveServer) content. There are several advantages to using simplified LiveServer URLs. 23.07.2009 This document outlines the installation and use of the Workflow Trigger service and its corresponding executable.